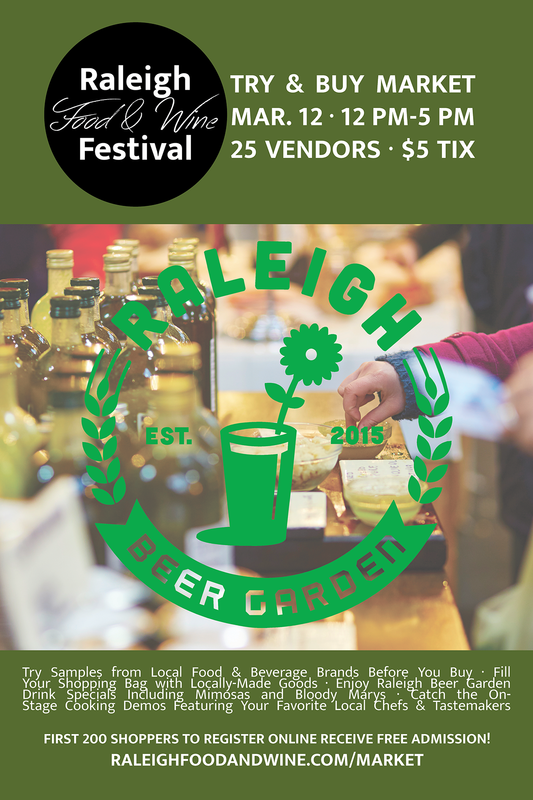 On Sunday, March 12, it’s time to spring forward and spring down to the Raleigh Beer Garden for the Raleigh Food & Wine Festival’s Try & Buy Market between 12 p.m. and 5 p.m.
20+ vendors will join in this exclusive event, sampling and selling local bites and goods. Patrons can enjoy the Sunday specials at Raleigh Beer Garden, including Bloody Marys and Mimosas, while filling shopping bags with local gifts and goodies. And there’s more than just shopping in store for this “Sunday Funday” event – hang around for the on-stage cooking demos featuring local chefs and tastemakers! This event is rain or shine, but don’t worry, Raleigh Beer Garden’s beautiful backyard has a giant tent to protect guests from the elements. Admission is $5.00 – with free tickets available for the first 200 registrants who reserve their complimentary tickets online in advance at RaleighFoodandWine.com/market, thanks to the support of market sponsors. Vendor space is available through Sunday, March 5, for just $50 which includes table, linen, and promotional tickets to the event at RaleighFoodandWine.com/businesses-register-to-participate/market-registration/. To stay up to date on all things Raleigh Food & Wine, like the official at Facebook.com/RaleighFoodandWine, follow on Twitter at @RaleighFoodWine, or follow on Instagram at @RaleighFoodandWine. For more information on the Raleigh Food & Wine Festival Try & Buy Market, contact festival co-founder Lisa Jeffries at [email protected] or call 919-229-9725. The Raleigh Food and Wine Festival is a four-day event highlighting some of the most unique offerings in food and beverage in the capital city. This year’s event takes place May 18-21, 2017. Learn more at RaleighFoodandWine.com. Co-founded in 2015 by Babylon Restaurant’s Samad Hachby and Raleighwood Media Group’s Lisa Jeffries, both 2015 and 2016 Sunday tasting events sold out a week in advance and featured over 40 participating businesses from around town. The Raleigh Food & Wine Festival is produced by Raleighwood Media Group + Raleighwood Event Group, publishers of DTRNews.com.